Classic January has started off with a bluebird day at Snow Mountain Ranch, YMCA of the Rockies for the first Classic citizen race of the month. The morning started below zero but the sun warmed up the air quickly. The tracks were set hard and beautiful. (Thank you Shawn and company!) And there was little wind. Wax was no problem – anything was going to grip. And the racers flew over the course. Local Kremmling athlete extraordinaire Tyler Scholl blew away the field finishing the 15K in 51:19 minutes. Second place Jamie Mothersbaugh clocked in at 54:28 with Matt Rossman right on his heels at 54:36. Dad Shawn Scholl was 5th with local Odd Bersvendsen 6th. The other Kremmling athlete extraordinaire Tabor Scholl topped the womens field finishing the 15K in 1:04:44 pushed hard by Patrick Brower, one of the East Grand Middle School Coaches. Tabor was over two minutes ahead of second place woman Lilian Miller and almost four minutes ahead of third place Meghan Cormwall. The Scholl siblings are Grand County grown and raced with the local schools. Middle Park High School and East Grand Middle School CHSAA season starts Saturday at Spring Gulch in Carbondale and, if the race results at SMR were any indication, our locals will be worth watching. The best opportunity to watch our kids will be the Same Day Pursuit at Snow Mountain Ranch hosted by MPHS Saturday January 26. That means the High School racers have to ski both classic and skate where you start your second (or pursuit) race staggered according to the time you finished your first (or sprint) race. That effectively combines the times of your two races and the first racer across the line wins. The Middle School racers do only the classic portion. Call Laura to volunteer at 970-531-8364 or email hs.nordic@egsd.org. The 7.5k finish line was a blur of local faces as 7 of the top 12 racers were either MPHS or EGMS racers or coaches. Alex Holinka finished second with Guy Granger, coach Dave Cleveland, Ethan Callarman, Isaiah Callarman, Sylvia Brower, and coach Travis Fuqua hot on his heels. Freshman Chance Hein rounded out the group. It’s gonna be a good season… The coaches have been working hard. Thanks to Anne at SMR for a well-organized day and Shawn for fabulous grooming and those upstairs for a wonderful Colorado day. Next weekend is the Grand Lake Classic with its family-friendly events and fee structures so hope to see you there. Meanwhile Granby Elementary needs volunteer helpers for the next two weeks. The Nordic Rocks program was started about 5 years ago by Central Cross Country Association (CXC) and the equipment has been improving every year. Click here for more information. Bill Pierce from SMR has provided skis for the Granby Elementary Physical Education classes of Maggie Keller thru the Nordic Rocks Program to have a unit on Cross Country skiing. Starting this week January 7-10, kindergarten thru 5th grade classes started the program with an introduction and dryland training inside the gym. The next two weeks January 14-17 and January 21-24 the kids will go outside and use Polhamus Park next to the school with snow groomed by the town of Granby. Each day the 45-minute PE classes start with the 5th graders at 840am followed by 4th and 3rd with the morning ending at 1105am. The afternoon starts at 130p with the 2nd grade followed by 1st grade then kindergartners finishing at 355pm. Remember our schools have classes Monday thru Thursday only. Dealing with a class of about 30 kids is no small feat and Bill Pierce and Maggie Keller need some volunteers to help. Please consider dropping in for a morning shift or afternoon shift to help kids learn exercises, learn equipment, and learn the skiing lingo. 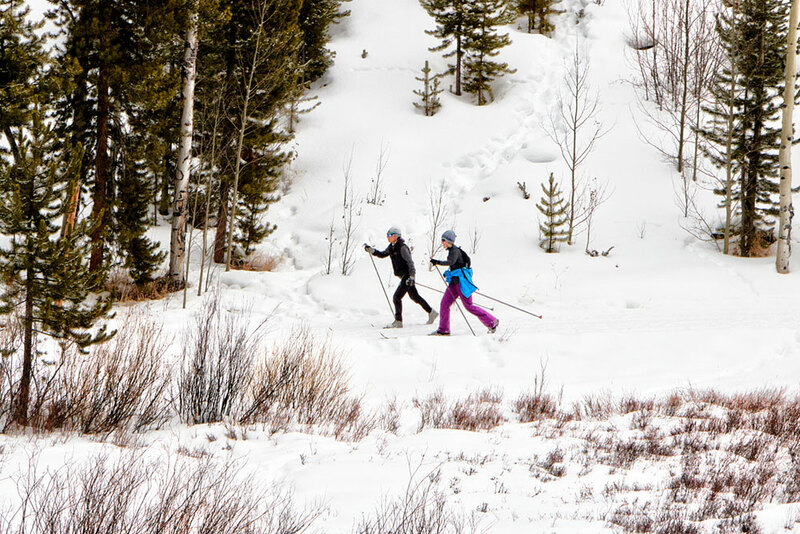 The skis are specially designed by Central Cross Country Association for elementary schools for easy on easy off using the child’s own boots for these short class periods. You will be given specific tasks per your ability to help even if it is as simple as putting skis on or taking them off. Helpers are needed regardless of your ability. Remember to stop in at the Elementary School office to fill out volunteer paperwork before coming to the gym – it just takes a few minutes. The most helpers are needed for the outside work weeks 2 and 3, particularly for the afternoon with K-2 age kids. Please be prepared for outdoor winter weather. If you love working with kids, this is a volunteer job for you! Email Maggie at maggie.keller@egsd.org or call Granby Elementary School at 970-887-3312.